(April 26, 2016 – Toronto, ON) I’m fairly certain if you wanted to work at Hot Docs you’d need to have thee key attributes: dedication, hard work, commitment to excellence. That’s the only way I can figure out how North America’s largest documentary festival gets better and better year after year. This year is no exception and the slate of films over the festival’s run is truly impressive. But, as regular readers know, Northernstars is all about Canadian films and so just head of opening night here’s a quick look at some of the Canadian documentaries screening at Hot Docs. Chances are tickets are tight for opening night. It’s a World Premiere of The League of Exotique Dancers from director Rama Rau. If you only know her work from No Place to Hide: The Retaeh Parsons Story, this is something completely different. This is a joyous look back to the lost art, or industry, known as burlesque. Who knew a League of Burlesque Hall of Fame existed? The doc follows several former dancers (one of them pictured above), including Canadians, who survived the era of bump and grind and some, at truly advanced ages, are ready to do it again all for the sake of their art, and this remarkable film. If you miss Thursday nights’ opening gala, The League of Exotique Dancers plays again Friday afternoon at 1:30. Keeping with music but moving from the burlesque stage to smoky juke joints and church halls, director Daniel Cross has crafted a musical travelogue titled I Am The Blues. Some of the legends featured in this doc include Bobby Rush and Barbara Lynn. All screenings are at the Tiff Bell Lightbox on May 2, 4 and 7. Spaceship Earth from Kevin McMahon may follow a traditional path of documentary filmmaking intercutting talking heads with archival or new footage, but this takes the tried and true and moves it to a whole new level. First of all it’s a very important topic and the people in this doc who do the talking are not just worth listening to, they command attention and just may have the answers that will save our failing planet. The footage comprises outstanding images of Earth taken from space and provide a constant nudge that this place we call home is worth saving. Spaceship Earth screens on April 30 at the Tiff Bell Lightbox and May 1 at the Elizabeth Bader Theatre and on May 7 at the Bloor Hot Docs Cinema. Those three films all screen outside the dedicated program called Canadian Spectrum. Within that group there are 19 features and 8 shorts. Thirteen of the features are World Premiere events. While most stay within our massive borders and a few narrow that focus to single locations, a handful of these docs were shot on a far broader stage. 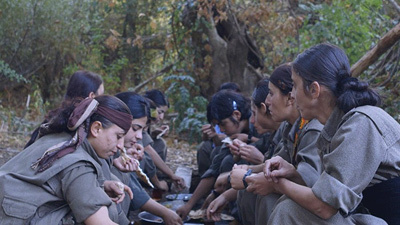 One such doc is the riveting examination of an all-female Kurdish fighting brigade (pictured above). Their fervent anti-ISIS stance is matched by both their physical strength and dedication to each other. Zayné Akyol directed Gulistan: Land of Roses. It’s a war film that is very different in a time when war itself has become very different. Set on the Tahitan First Nations Territory in British Columbia, Koneline: Our Land Beautiful uses the big screen to show us some awe-inspiring landscapes. But all is not well in this beautiful land and it comes down to decisions that must be as old or older than confederation. Some of the people embrace change and take jobs that scar and mar their cherished land, while others don’t want change or at least this kind of change. There is plenty of evidence in Nettie Wild’s documentary that some of the traditional ways remain valid and lucrative. The film follows many threads but always returns to the majesty of the mountains that at once seem timeless and yet are under threat by change. 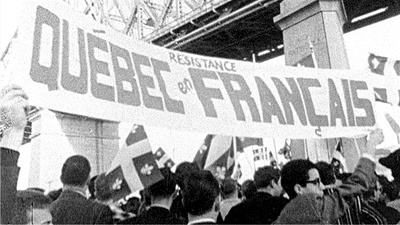 Narrowing the focus a little, former Montrealer John Walker takes a hard look at what once was his home province in a thoughtful doc titled Quebec: My Country Mon Pays. There are some 500,000 former English-speaking residents of what used to be called La Belle Provence. It’s a safe bet that every one of them at some time or another has pondered the events that either drove them from their homes, or perhaps just invited them to leave. Walker’s trip back home and back in time touches on many areas of a conflict that has gone from cerebral to violent back to something akin to a benign cold. Annoying, but not much more. His journey also has some very personal moments and that helps drive the feeling that the loss of one’s territorial foundations can ripple across the years and leave a potentially malignant disquiet. There is for some the awful truth that you can’t go home again. Another narrowing of the focus and we are now in the south-central part of Montreal in a neighbourhood documentary titled just that but in French. A Centre-Sud Tale from Danic Champoux shows a side of a city, my home town, I didn’t know existed. Or still existed to be more accurate. It isn’t an up-and-coming spot on the municipal map and it suffers from many of the defects all large cities suffer from. There is poverty, drugs and hookers hanging out on the same streets where children play. It’s an eye-opener yet there is a gentle love and respect as Champoux puts his own family under the microscope and produces a film that is touching in one scene and quite disturbing in another. The focus narrows once more. This time to the confines of a jail cell. Matt Gallagher’s doc, How To Prepare for Prison isn’t really meant for those in the audience facing jail time. It’s a look at a system that in its mechanical processes sets out with the cruel purpose of breaking the human spirit before breaking whatever’s left. As the small blurb about this movie says, “stark fear dominates the lives” of those profiled in this important film. 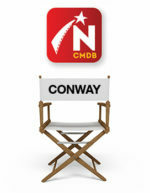 Northernstars will report on other Canadian films during the festival, which runs from April 28 to May 8. There is much more on these films and others at this year’s festival. Click here and look for the link to the Canadian Spectrum.